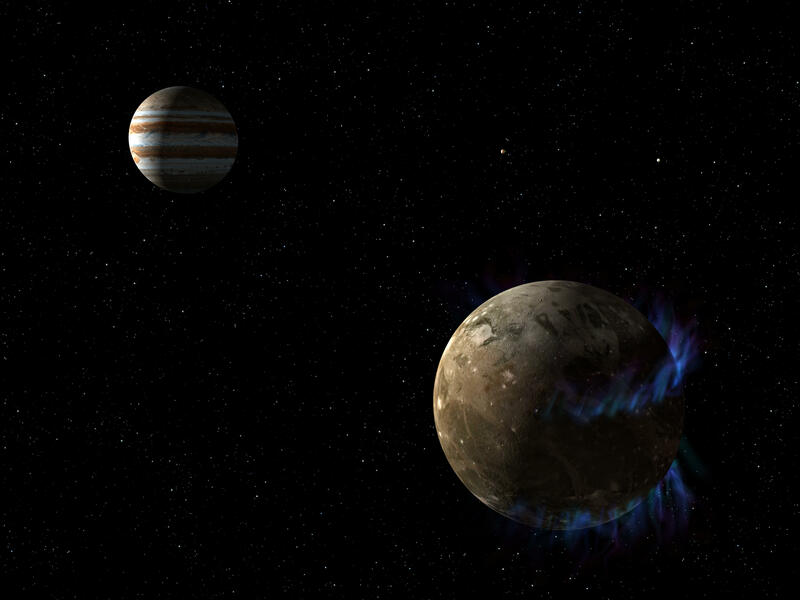 In this artist’s concept, the moon Ganymede orbits Jupiter. NASA’s Hubble Space Telescope observed aurorae on the moon generated by Ganymede’s magnetic fields. NASA announced late Thursday that the Hubble Space Telescope provided compelling evidence that Ganymede, Jupiter's largest moon, is home to a large subterranean ocean that could support life. Astronomers believe that the ocean could contain more water than all of Earth's bodies of water combined. "This discovery marks a significant milestone, highlighting what only Hubble can accomplish," remarked John Grunsfeld, associate administrator of NASA's Science Mission Directorate. Ganymede is unique in that it is the only moon in the solar system to have its own magnetic field. The strong field causes aurorae, ribbons of electrified gas, to circle the moon at each of its poles. Through close observation of the aurorae's motion, scientists determined that the magnetic field is influenced by a large amount of saltwater beneath the moon's crust. "A deep ocean under the icy crust of Ganymede opens up further exciting possibilities for life beyond Earth," concluded Grunsfeld.